American sonic terrorist Jon Leidecker has also appeared as Wobbly, under which name he produced crazy sounds which I tend to associated with the zany cut-up and sample school of operations, and was unsurprised when he made a record with People Like Us. I was genuinely flattered when Jon once sent us a letter saying that he enjoyed The Sound Projector, adding “you are all insane”. 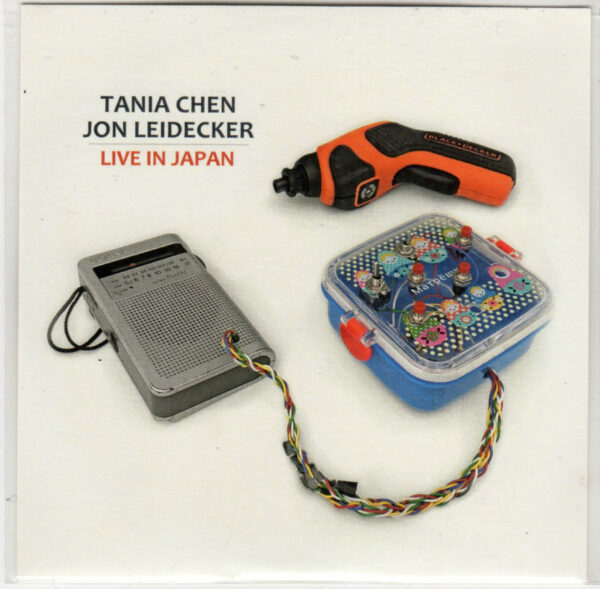 Jon has teamed up with Tania Chen for today’s release, Live In Japan (EH? AUDIO REPOSITORY EH? 102), which documents highlights of their 2017 tour when they took in Osaka, Chiba, Yokohama, Kyoto and Tokyo and assaulted many listening Asians with their peculiar brand of electric noise. Pianist Tania Chen is a member of Bad Jazz who have appeared on this label, but has also build up a considerable reputation performing John Cage and other giants of the avant-garde, sometimes as part of the group Apartment House. Live In Japan is a lively mix of alien sounds, disco beats, and wild noises, all arranged in unpredictable and illogical sequences, and sometimes fed through effects boards to produce echoing patterns. The photos on the cover suggest that radio sets, toys, and hardware tools were used as part of the act. From 16th August 2018.